Beware your sins will find you out! Tiger Woods has strived to keep his family life and private affairs exactly that, private. In fact, the name of Tiger's yacht is PRIVACY. However, he wont be able simply sweep this conundrum under the rug. Tiger cheated on his wife, Swedish model Elin Nordegren Woods, and the world wants the trueth. November 28, 2009 Tiger Woods sped away from his Florida mansion at 2:25 am and collided first with a fire hydrant and finally with a tree in his neighbor's front yard. Just moments later wife, Elin Nordegren Woods, showed up and reportedly broke out the back window of his Cadillac SUV to rescue a dazed and confused Tiger from the wreckage. Tiger was allegedly unconscious for six minutes, his face was covered with lacerations, and he was immediately rushed to the hospital. Initial reports stated that Woods was in critical condition. However, such is standard policy for anyone who is hospitalized. Surprisingly it took thirteen hours for the news of this tragic event to become public. Regardless of the fact that Tiger cancelled multiple interviews with the local law enforcement the police released a statement clearing Tiger's accident of domestic dispute, intoxication, and reckless driving. November 30, 2009 Tiger Woods withdrew from his own tournament, The Chevron World Challenge, citing injuries from his accident just days before. Tiger stated that he would not competing anymore this year in an effort to recover. 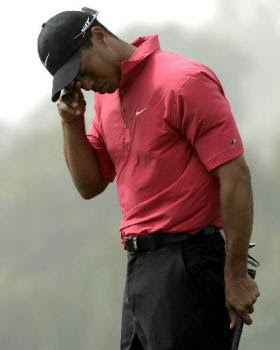 Tiger said, "I am extremely disappointed that I will not be at my tournament this week. I am certain it will be an outstanding event and I'm very sorry that I can't be there." December 1, 2009 Tiger Woods was charged with careless driving and fined $164 by Florida authorities. According to the highway patrol, Tiger Woods will not be prosecuted with any criminal charges and has released this statement, "Despite the celebrity status of Mr. Woods, the Florida Highway Patrol has completed its investigation in the same professional manner it strives to complete each traffic investigation." December 2, 2009 US Weekly published a story about an alleged relationship between Jaimee Grubbs and Tiger Woods. Grubbs claimed that she met Tiger at a Las Vegas nightclub the week after the 2007 Masters, just two months before Tiger's wife, Elin Nordegren, gave birth the their first child, daughter Samantha. Grubbs goes on to say that she has over 300 text messaged from Tiger. The US Weekly web site published a recording of an adult male, who refered to himself only as "Tiger", pleading with Grubbs to change her voicemail. He continued to say that his wife has gone through his phone. Later on December 2, 2009 Tiger released this statement, "I have let my family down and I regret those transgressions with all of my heart. I have not been true to my values and the behavior my family deserves. I am not without faults and I am far short of perfect. I am dealing with my behavior and personal failings behind closed doors with my family. Those feelings should be shared by us alone." The good news: Many of Tiger's sponsors reported Wednesday December 2, 2009 that they will still be doing business with "Team Tiger". Tiger's supporters are as follows: Nike, Gatorade, EA Sports, TLC Vision, NetJets, and Gillette. Other sponsors declined to comment. They are as follows: AT&T, Accenture, Tag Heuer, and Upper Deck. Sure Gunnar, it is my pleasure to bring you the latest and greatest information regarding golf! Thank you for visiting SC Golf. Come back and see us again!